The Church, in honouring the saints, normally celebrates, not their birthdays, but their dates of death, which the Church regards as their birthdays into eternal life, Heavenly glory. However, there are three exceptions to that simple rule: December 25 - the birth of Our Lord; September 8 - the birth of Our Lady; and June 24 - the birth of John the Baptist. And what do those three have in common? The first two, Our Lord and Our Lady, are conceived without original sin; and John the Baptist is born without original sin. We presume that the moment of his sanctification is, not at his conception, but when Our Lady visited Elizabeth, resulting in John the Baptist leaping for joy. But though the Birthday of Mary seems to be a great day for the Church to honour her with a grand celebration, the Church chooses not to do so. The greater feast is today, celebrated as a solemnity, a first class feast which shares the rank of a Sunday. And it is a day chosen to commemorate not the birth of Our Lady but her conception in the womb of St Anne. This is because the Church teaches that her sanctification, her freedom from sin, took place from the very moment of her conception. This is what the Immaculate Conception is all about. Contrary to popular myth, this feast is not about her virginity. Neither is it about the virginal conception of Our Lord in her womb. But, rather, it is a feast that celebrates God’s original plan for humanity before the fall, and His redemption after the fall. Our Lady is the first to be redeemed. To understand Our Lady’s role in the whole scheme of God’s plan of redemption, let us take a closer look at sin and, particularly, original sin. Sin is not some “thing”, or some “black mark” that appears on our otherwise pristinely white souls. For it was so simple then, going to confession is like going to the laundrette to have your soul washed clean. Well, that's not a bad way to try to explain something to children, but it's a little inaccurate. Sin is not something; it is a lack of something, a deficiency. It's an absence - an absence of grace, which is the life of God. Our first parents, Adam and Eve were created in a state of grace, a state of original holiness. They were created to be with God forever in Paradise. Their sin, however, took that state away. Sin wasn’t an add-on and certainly gave them no added value. No, sin took everything that was worthwhile, everything that was worth living for, away from them, including eternal life. They who were meant to have everything, were dispossessed of everything. You and I all inherit that deficiency, which the Church calls Original Sin. The only One preserved from that deficiency was Our Lady. 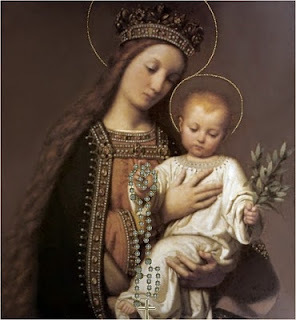 When Cardinal Newman was trying to help Protestants understand who Mary as “the Immaculate One” is, he came up with a very clever title for Our Lady. He referred to her as “the daughter of Eve un-fallen.” You and I are the sons and daughters of Eve in her fallen state. Mary, however, is the daughter of grace, Eve would have had, had she not sinned. In her, we see what life would be, before the Fall. This reminds us, of course, that God's original plan for us was that of holiness and grace, not sin and alienation. Holiness was meant to be the ordinary state of life. Holiness is what makes us truly human, not sin. And, it's important to regain that focus: to make that original plan our own personal plan. This unique privilege of the Blessed Virgin Mary, completely unmerited by her, seems to make her a super-human, beyond the reach of us mere mortals. But this is a problem with our perspective. Mary is the complete human being, and we are the defective ones. We are the hollow men, the badly drawn boys and girls, incomplete like the stick figures on the door of restrooms. But Mary is a human being as she ought to be, replete with and completed in grace, fleshed out, full-bodied and perfected in her life. Our Lady is perfect because she is most perfectly natural, and she is utterly natural because she is filled-with-grace. Mary is full of grace because Christ is the fullness of grace, and it is from His grace that we have all received grace upon grace. Mary shows us our true vocation and God’s original plan for us. This is what today’s second reading tells us: we are chosen in Christ eternally, chosen to become holy and to be enfolded in God's friendship. In fulfilment of His timeless love, the Father sent His Son into history, and through His death and resurrection poured out the Holy Spirit on people of all times. The Spirit was at work in Mary from the first moment of her existence, making her holy, free from sin. The salvation of Mary, the Immaculate Conception, is a pre-sacramental salvation. Mary does not need baptism. From the beginning of her existence she was utterly filled with God's grace. You and I, and the rest of humanity, inherit original sin and its effects, and we have to submit afterwards to the medicine, which is called Baptism. God did something better for His Son's Mother - she never had to suffer the deficiency, to begin with. And this is why the Immaculate Conception is so important for us. Mary's pre-sacramental salvation is a sign of our post-sacramental life in the Kingdom of heaven. Unlike Mary, the Spirit begins the same work in us at our baptism. We have not yet been brought to the same integrity the Spirit wrought in Mary. So we find it difficult to imagine a sinless life. We are so used to little compromises that we forget a sinless life is fully and richly human, not somehow inhuman. Because the sin of the fallen angels, the first sin of human history, the root of all sin, is pride, we tend to suppose that the ability to say 'No’ to God is a sign of freedom and somehow safeguards our dignity. But Our Lord has come to remind us that sin is a slavery. It is saying ‘Yes’ to God that we are truly free. In today's Gospel we hear of Our Lady’s fiat, her great free act of saying ‘Yes’, made in the power of the Spirit who had been at work in her from her beginning: “Be it done unto me according to your word.” As the first Eve drew her Adam to his act of disobedience, so Mary the New Eve was enabled to draw the New Adam to his saving act of obedience, ultimately to say ‘Yes’ to the great sacrifice that had to be made on the cross.